Designed to help prevent ankle injuries, the Aircast Sport-Stirrup is based on the Air-Stirrup Ankle Brace but has a narrower design for less bulk in a sneaker or shoe. The Aircast Sport-Stirrup has anatomically designed shells that prevent inversion/eversion. Each shell is lined with the patented Duplex™ aircell system. This exclusive system incorporates two pre-inflated overlapping aircells, distal and proximal, that provide support and protection during ambulation. My daughter does all star cheerleading and has a tendency to roll her ankles, she needs a good support brace for tumbling & flying but it needs to be thin enough to fit in her cheer shoe (which is much smaller and thinner than a regular athletic shoe). She has been looking at the Aircast Sport Stirrup but I'm not sure if it will allow the flexibility she needs for the sport or fit in her shoe, do you have any recommendations? She may have trouble getting that brace into her shoe. Try the aircast A60 ankle brace. It is lighter version of the Airsport and should fit better into the shoe. Can I wear this with my shoe on or do i have to make adjustments. I am recovering from a surgically repaired fractured ankle (distal end of fibula) and am walking more or less normally on the flat, and making good progress in physical therapy. However in a month I will be on a long-anticipated trip where I may be doing some walking on rough or uneven ground (forest trails). I would like a brace that will prevent my turning my ankle and undoing all my progress. It would have to fit into a walking boot/shoe. What do you recommend? I have just purchased a Aircast Sport Ankle Brace for lateral stability for transition out of a cam boot walker for an achilles injury, and from the time I got it out of the box I have had difficulty with the splint sliding back off of my foot. I have tried adjusting the heel width, and the air in the bladders, still no luck. Also, I have found that at times the bottoms of the air bladder is not staying stuck to the outer shell, and I find I have to readjust. I have tried different shoes with no improvement. I have a very skinny ankle, I am not sure if this is the issue, but I need this product to work. Any suggestions? I have a Charcot Anthropathy ankle and my ankle "leans over to the right"; I'm hoping this brace "can help my ankle straighten back up-right" and stay that way. I've been prescribed custom fit plastic braces to stop the leaning progression, but they were too uncomfortable to wear, so I had to stop using them. How comfortable is the "padding" used; do you get "rubbed/sore spots"? Also, does the material cause sweating ? It is used to treat chonic instabilities. It has the rigid outer supports that are lined with Air cells that can be inflated to provide you with more comfort. If you have any other questions please do not hesitate to contact us. I would appreciate the actual height/ width for this brace compared to the other ankle stirrup brace. I am not sure which one will work best for me. The Sport Stirrup is 9 inches high and it will be about 1/2 an inch thinner on your leg than the standard Stirrup. 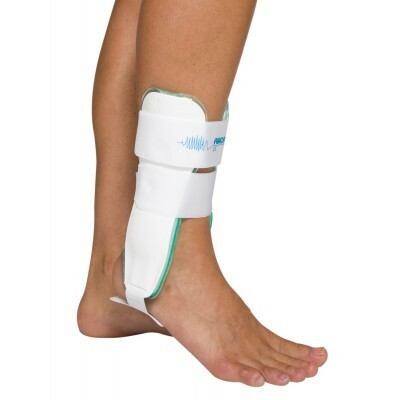 This brace stabilizes the ankle but still allows for comfortable running. I got a moderate sprain last month and have been using it while playing soccer. Very comfortable, supportive, and it fits well in the shoe! You almost forget it's there. It holds up well to the sharp turns and cuts you make on the field, and I feel very protected while wearing it. Unfortunately I order the wrong style, but it fit very comfortably. I kept it because I have very weak ankles and may have to use it in the future (but I hope not). Your delivery was very quick and would definitely order from you again. I really like the compact size and it gives me equal support as the larger size. I like the style and fit of this one rather then the black universal one, which is not as comfortable. I wear in my walking shoes and my sandals, with no problems. Cons: Tape didn't last long, wish it come in black also. I like this product, however even when I loosen it on my ankle my leg (above the stirrup) swells. It actually forms a "ridge" above where the aircast stirrup stops. When I remove the aircast stirrup for about a half hour the swelling goes away. Pros: Easy to use, light weight. Cons: Prevents swelling where splint covers, but promotes swelling above the splint. Great product, great price! Thank You!!! I have an arthritic ankle and ride horses for a living. I wear this inside my boot. Don't go to work without it!! !